Is there nothing they won’t consider harassing us over? Do they not realize they are killing the proverbial goose that laid the golden egg? Once all private enterprise is crushed, whom will they leech off of? A new rule being proposed by the federal Department of Transportation would require farmers to get commercial drivers licenses. The Federal Motor Carrier Safety Administration, which is a part of DOT, wants to adopt standards that would reclassify all farm vehicles and implements as Commercial Motor Vehicles, officials said. Likewise, the proposal, if adopted, would require all farmers and everyone on the farm who operates any of the equipment to obtain a CDL, they added. The proposed rule change would mean that anyone who drives a tractor or operates any piece of motorized farming equipment would be required to pass the same tests and complete the same detailed forms and logs required of semi-tractor trailer drivers. Drivers would keep logs of information including hours worked and miles traveled. Vehicles would be required to display DOT numbers. A CDL in Virginia costs $64 for eight years, or $8 per year, not including the cost of an instructional class and the written test. Read the rest at the Gazette-Virginian. Catherine Austin Fitts was Assistant Secretary of Housing and Federal Housing Commissioner at the U.S. Dept. of Housing and Urban Development during the administration of George H.W. Bush. She is now the president of Solari, Inc., and managing member of Solari Investment Advisory Services, LLC. Here she explains how a financial coup d’etat was undertaken two years ago in order to bring the developed world under corporate ownership. The inevitable consequence of the looting of the American people is upon us. The ruling class controls the wealth while the impoverished masses scrounge for sustenance. Expect more outbursts, more security clampdowns, more abuse of citizens by agents of the state, and more restrictions of speech. There is a telling detail in the US retail chain store data for December. 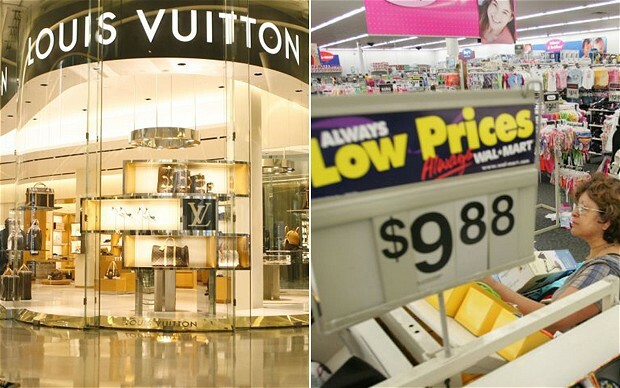 Stephen Lewis from Monument Securities points out that luxury outlets saw an 8.1pc rise from a year ago, but discount stores catering to America’s poorer half rose just 1.2pc. Tiffany’s, Nordstrom, and Saks Fifth Avenue are booming. Sales of Cadillac cars have jumped 35pc, while Porsche’s US sales are up 29pc. Cartier and Louis Vuitton have helped boost the luxury goods stock index by almost 50pc since October. Yet Best Buy, Target, and Walmart have languished. Such is the blighted fruit of Federal Reserve policy. The Fed no longer even denies that the purpose of its latest blast of bond purchases, or QE2, is to drive up Wall Street, perhaps because it has so signally failed to achieve its other purpose of driving down borrowing costs. Yet surely Ben Bernanke’s `trickle down’ strategy risks corroding America’s ethic of solidarity long before it does much to help America’s poor. The retail data can be quirky but it fits in with everything else we know. The numbers of people on food stamps have reached 43.2m, an all time-high of 14pc of the population. Recipients receive debit cards – not stamps — currently worth about $140 a month under President Obama’s stimulus package. The US Conference of Mayors said visits to soup kitchens are up 24pc this year. There are 643,000 people needing shelter each night. Jobs data released on Friday was again shocking. The only the reason that headline unemployment fell to 9.4pc was that so many people dropped out of the system altogether. Read the rest at The Telegraph. “Government Against the People” mentioned this possibility last year and was accused of indulging in conspiracy theories. We stand by our assertion that the same thing could happen here. People’s retirement savings are a convenient source of revenue for governments that don’t want to reduce spending or make privatizations. As most pension schemes in Europe are organised by the state, European ministers of finance have a facilitated access to the savings accumulated there, and it is only logical that they try to get a hold of this money for their own ends. In recent weeks I have noted five such attempts: Three situations concern private personal savings; two others refer to national funds. The most striking example is Hungary, where last month the government made the citizens an offer they could not refuse. They could either remit their individual retirement savings to the state, or lose the right to the basic state pension (but still have an obligation to pay contributions for it). In this extortionate way, the government wants to gain control over $14bn of individual retirement savings. The Bulgarian government has come up with a similar idea. $300m of private early retirement savings was supposed to be transferred to the state pension scheme. The government gave way after trade unions protested and finally only about 20% of the original plans were implemented. Read the rest at The Christian Science Monitor. Do you think you have the right to toss a gift card in a drawer for a couple of years and use it later? What, do you think the money is yours or something? Seriously, this is the equivalent of the completely busted-out state rummaging under the sofa cushions for random change. And it presses the precedent that your assets belong to the state whenever the state says it does. The New Jersey Treasury Department has signaled it won’t abandon its effort to seize unused money on gift cards and traveler’s checks. State Treasurer Andrew P. Sidamon-Eristoff has told a U.S. District Court judge in Newark that the state will appeal a Nov. 13 ruling that temporarily struck down a new law concerning seizures that was enacted in July as part of Governor Christie’s budget. The legislation amended part of the state Uniform Unclaimed Property Act to include gift cards for the first time, allowing the state to consider a card abandoned two years after purchase and seize the balance. File this article under “civil unrest.” The year 2011 may well be the year of the popular uprising as austerity hits home throughout the developed world. The unrest will be more acute in Europe than in the U.S. because the U.S. isn’t as highly socialized and fewer people are dependent on government largess—so far. Unions are gearing up for a demonstration in the spring against the Government’s massive cuts in public spending, predicting it will be a “huge” national event. The TUC is organising the protest in London on March 26 and said that by then, the impact of the austerity measures will have started to take hold, with an expected loss of tens of thousands of jobs. Union members from across the UK are set to join the demonstration in London’s Hyde Park, which will follow a series of protests in recent weeks against increases in student tuition fees and cuts in public services. TUC general secretary Brendan Barber said: “People have yet to feel the full impact of the Government’s cuts. When they do – as we saw with the cancellation of the schools building programme – they have been angry. “But in 2011 thousands of people will lose their jobs and councils will have little choice about slashing away at popular and vital services.